Are you spending too much of your time burrowed away in the office? Did you waste more hours at your desk in December than you did in November? Just how much overtime pay does your boss owe you? Keeping a log of your work hours can be helpful for all kinds of reasons and you can automate the whole process using your phone and IFTTT. First of all a hat tip to @rothgar who put this recipe up on IFTTT last year. Part of the beauty of If This Then That is the way in which you can browse through recipes created by other users and see what's proving popular with the community. Of course you can also share your own ideas for plugging together different apps and services. If you've never come across IFTTT before then you're going to need to sign up for a free account through the web interface. It's an invaluable tool for connecting different websites, apps and services together; save Instagram photos to Dropbox, get weather reports over text, save starred Gmail messages to Instapaper. The possibilities are virtually endless. You're also going to need to install the IFTTT app on your iPhone, as this will keep track of where you are during the day. 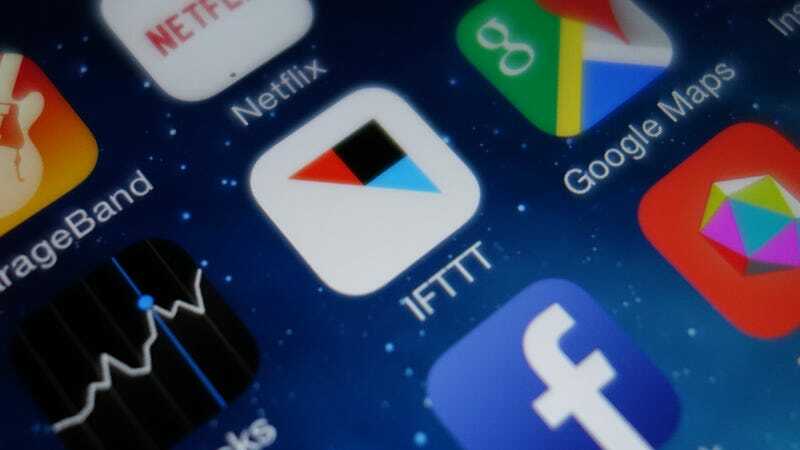 You can run the same recipe using the IFTTT app for Android, though in this article we're sticking to iOS specifics for the sake of simplicity. But basically for an Android phone, just choose Android location instead of iOS Location when making the recipe; everything else is largely the same. We'd also recommend creating a separate Google calendar for IFTTT to use, otherwise your main one is going to get a little cluttered with timestamps. From the online interface you can do this via the drop-down menu next to your current calendars. All you need to do is put in a name ("IFTTT" or similar) and the default options should work fine for everything else. Add in a description if you really think you're going to forget why this calendar is here. Once you're logged into IFTTT on the web, click Create a Recipe. You want to choose iOS Location as your trigger, at which point you'll be prompted to activate the channel. Switch to the IFTTT app on your iPhone and tap the mortar and pestle icon followed by the cog icon. This gets you to the settings screen where you can tap Channels and iOS Location to activate the feature. You're going to need to give permission for IFTTT to access your location even when the app's not running. Back on the web you should now see three options: entering an area, exiting an area or both. You can tweak the recipe as you wish, but in this case we're going to choose You enter or exit an area. There will be the opportunity later to attach a label to the timestamp that indicates whether you were coming to or going from your office. The next step is to pinpoint the location of your workplace: Use the search field, the zoom buttons and the panning options to find it. Click Create Trigger and you're all set to move on to the next stage—the IFTTT recipe will run whenever you go into or come out of the area you've specified (assuming your iPhone is reporting your location correctly). For your action channel, choose Google Calendar. Again, you'll need to activate the channel if you haven't already done so. This is simply a question of entering your Google credentials when prompted and giving IFTTT permission to access your calendars. It's at this point you'll be asked to choose a specific calendar for IFTTT to use, so pick the one you set up earlier. Unfortunately you can only use one calendar across all of your recipes, so that may interfere with some of your other ideas, but it's a limitation you'll have to live with for now. There's only one action to choose—Quick add event—and you can then customize the calendar entries as you like. The OccurredAt field will put a time stamp on the entry and EnteredOrExited will mark whether you're coming or going. If you like, you can even attach the map URL, though it will always show your workplace. Click Create Action and you're just about done. The beauty of IFTTT is you can adapt your recipes in many different ways. You could pipe your working hours into a Google Drive spreadsheet, for example, or log time spent at the beach rather than in the office. The same functionality can be used to let you ping others when you've got home, and so on.